Ethan Hunt (Cruise) and his team (Renner, Patton, Pegg) are disowned after an explosion at the Kremlin, and have to race to prevent nuclear war. Director Bird marries audacious action sequences with subtle humour. The main characters lack complexity and the villain disappoints, but otherwise a solid crowd-pleaser. This holiday season, two-time Academy Award®-winner Brad Bird directs, with producers Tom Cruise and J.J. Abrams, the action-packed spy adventure Mission: Impossible - Ghost Protocol. Tom Cruise returns in the starring role as Ethan Hunt and is joined by an international cast that includes Jeremy Renner, Simon Pegg, Paula Patton, Michael Nyqvist, Vladimir Mashkov, Josh Holloway, Anil Kapoor and Léa Seydoux. 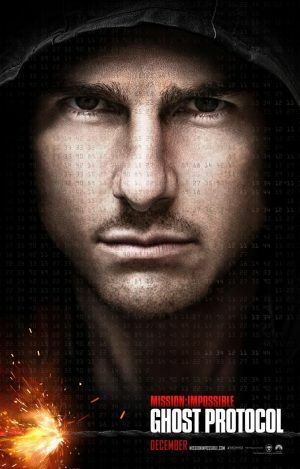 Mission: Impossible- Ghost Protocol The IMAX Experience will feature select footage shot with IMAX cameras. The IMAX release will be digitally re-mastered into the image and sound quality of The IMAX Experience with proprietary IMAX DMR (Digital Re-mastering) technology. The crystal-clear images coupled with IMAX’s customized theatre geometry and powerful digital audio create a unique environment that will make you feel as if you are in the movie.